This is more an illustrated book with comics elements rather than a graphic novel per se. 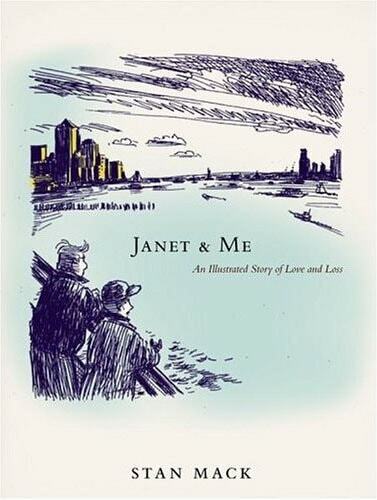 It is New York cartoonist Stan Mack’s homage to his lover Janet Bode who died of disseminated breast cancer, a touching and engaging account of their experiences in “Cancerland”. Unlike the other books about cancer listed on this site, this one is about dying rather than surviving. Written by the carer rather than the patient, it also covers the grief, lonelyness and legal complications of the immediate bereavement period. It covers similar themes to Cancer Vixen and Mom’s Cancer, and makes be grateful for our less than perfect british NHS. If you get sick in the states, there is no coheerent system- only private providers, and it is all fragmented. Treatment is negotiated by the patient’s insurance company, patients have to shop around for specialists and then, whilst most vulnerable, are caught in “billing Hell”. Janet’s oncologist is reluctant to admit “defeat” and pass her on to a hospice for terminal care, and, when she finally does, is never heard from again, seemingly losing interest completely. Communication problems are highlighted, there seems a lack of straight talking from the doctors, none of whom seem willing to tell her how Ill she is, resulting in an emaciated, bed bound and incontinent Janet still hoping for a cure. A hospice nurse tells Stan that the oncologists refuse to accept death. During treatment, Janet is subjected to cold calls from rival doctors offering alternative regimes. Mack wrote and drew this book after Janet’s death, but while she was ill he did publish some cartoons, reproduced in this volume. He drew a darkly humourous one about caring for Janet in last weeks which was published on the eve of the millenium and recieved hateful abuse and criticism from outraged correspondants protesting his poor taste!